Thanks to a certain lovely someone who plonked a bottle of Spanish red "Drac Magic" on my desk the other day, I have a really nice wine to brag to you about, in the hope that you might buy some to enjoy for yourself. 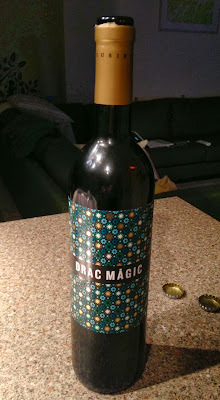 Drac Magic (Catalan for Magic Dragon) is a delicious red from Catalunya, a blend of Tempranillo, Garnacha and Syrah, made by Tomas Cusiné. Tomas Cusiné makes some truly weird and wonderful wines. The effortlessly cool but unreservedly bizarre wine-equivalents to underground indy bands in the music world, Tomas Cusiné's wines definitely give your taste-buds something to think about. Apart from looking straight-up awesome, Drac Magic is absolutely delicious. It is very fruit driven but has a delicious touch of cedar wood on the nose. This is medium-bodied with firm tannins but plenty of acidity. The level of acidity makes the wine seem much more approachable than it would be without it because it is very fresh and juicy. The fruit flavours are delicious, with cherry, blackcurrant and even a hint of blueberry on the palate. Sweet and fresh. Über awesome. The flavour evolves beautifully and on the finish there is a nice savoury touch, even a hint of parma violet just to top things off. This is a pretty mental drop, perhaps an acquired taste, especially if you like more 'traditional' reds, but it really is interesting and wild. 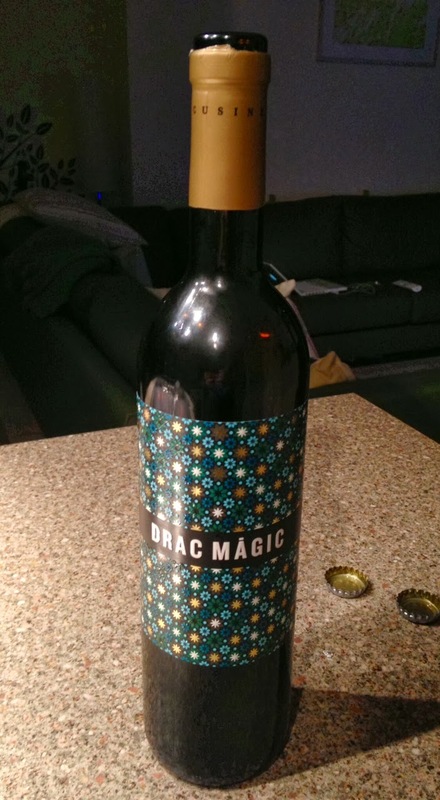 Drac Magic is a perfect mix for meaty dishes with a little bit of spice: it's amazing with chorizo and even better with a bit of chili con carne, but it's also worth sipping on its own. Quite frankly, if you don't get a bottle, you're missing out. At only £7.95 from The Wine Society, you are getting a hell of a lot of booze for your buck and provided you have an open mind, you will not be disappointed by this one at all.